Almost every cruise involves some sort of unexpected challenge(s). They can be mechanical, weather, health, accident or any combination. These challenges force one to repair, fix, overcome, adapt, postpone, ignore, get help from friends, pay for help, buy parts…. Often, handling such challenges involves something we’ve already covered - “Boaters Helping Boaters”. Tug’n: I had spent a month in late April and May installing new equipment on our boat four to five days a week in small spaces and awkward positions. By the time we were ready to leave in late May, my back was causing me some grief. 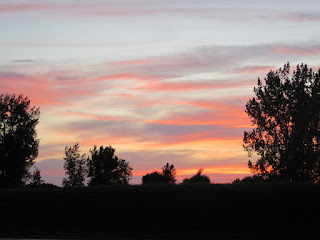 A visit to a useless chiropractor in Bobcaygeon proved to be a waste of time. However, a visit to a brilliant and highly skilled chiropractor in Montreal has started me on the road to recovery. Here’s hoping all these challenges are resolved in a timely manner with no measurable impact on our cruising plans. Since departing Penetanguishene on Georgian Bay on May 27th, through to June 18th in Montreal, we had only anchored out twice and Fran & I were really missing the peace and tranquility of anchoring. Sir Tugley planned on staying in Montreal a further week or more while they finalized arrangements for the replacement hull for their dinghy and Wings decided they’d stay at the marina for a couple more days while a heat alert was looming for Montreal. We spoke to local boaters and got some great tips on where they go to anchor nearby. 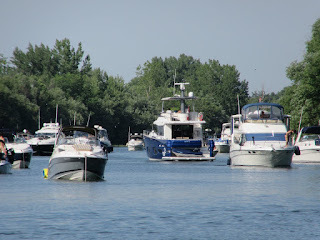 Off we headed on Saturday mid day to Parc National des Iles-de-Boucherville. This was a short 7 nautical mile journey to a group of islands that is something like Montreal’s equivalent to the Toronto Islands, without the docks, yacht clubs and marinas. There are narrow channels between the islands and because they are in the St. Lawrence River, a current is constantly flowing through the channels. As it was going to be a sunny, hot weekend, boats were streaming to the islands. When we got there, the channels were lined with boats anchored on each side of the channel, either individually or rafted in groups of 2, up to 5 boats across. The current keeps the boats neatly lined up one behind the other. We meandered up a channel that had been recommended to us, weaving between the boats and found a spot to anchor Tug’n. Once secured, we enjoyed a lovely lunch in our cockpit and watched the steady flow of water craft all the rest of the day. There were cruisers, runabouts, sea doos, canoes, kayaks, paddle boats all moving up and down the channels. Most of the power boats had “bikini clad bow fluff” on display and no one seemed the least bit concerned about getting too much sun. All canvas bimini covers were stowed and everyone was out to get as much sun as possible. What entertainment. We spent the afternoon reading in our shaded cockpit and watching the boats and people. Our happy hour and dinner were also spent in the cockpit. By 2100 hours, the vast majority of boats were gone leaving only a handful of us for the night. The scene was repeated again on Sunday, but with slightly less traffic as it was Fathers’ Day. I got wonderful phone Fathers’ Day phone calls from Rina, Morgan and Rina and some of the grand children. While there was a heat alert in Montreal, at anchor we had a steady breeze, shade in our cockpit and periodic dips in the water. It isn’t quite like taking a swim in a lake. Here you have to be concerned about the current and not getting too far away from your boat. We followed examples of others and tied our life ring with its 50’ line to a cleat on the stern of our boat. Then we’d get in the water and hold onto the life ring and enjoy the cool water. 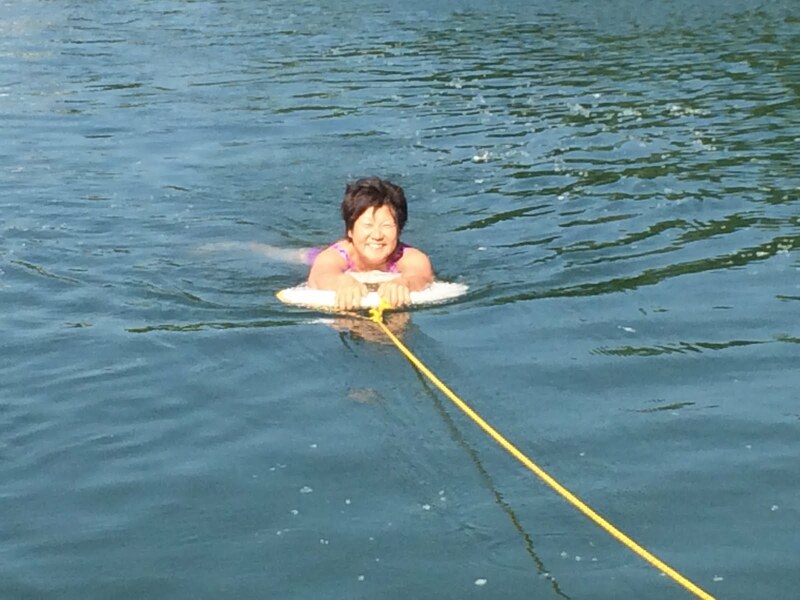 To get some exercise, we’d move up the floating line a little and start swimming. At a modestly fast pace, you’d stay still in one place with the floating line right beside you for when you’d had enough. On Monday, June 21st, Bob and Jan on Wings joined us at the anchorage. Originally, we’d planned on moving further down the St. Lawrence to another anchorage, but the weather forecast made us change our minds. Weather is all important for boaters. We usually get the forecast a couple of times a day. Historically, we’d get the marine forecast over the VHF Radio through Weather Radio Canada. These day’s it is easier to go to Environment Canada’s web site and get the info. Below is a copy of the forecast for today. 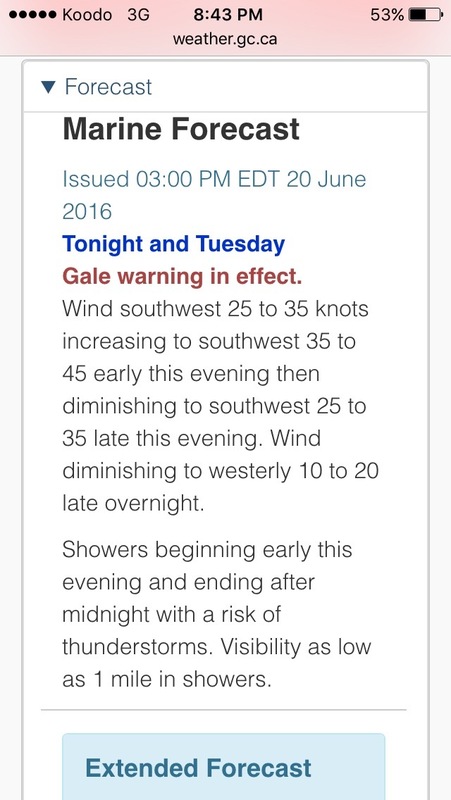 The red banner saying “Gale Force Winds” got our attention. 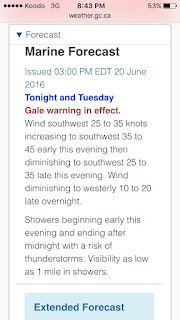 A forecast like this forces a boater to evaluate what the impact will be and determine what preparations they should make (move or stay; put out more anchor rode; store any loose gear; have an escape plan if something unexpected happens etc). We’d quickly concluded we were in a good location. The wind direction was going to be basically the same as what we’d had. We had some pretty good protection from the wind via the shape of the shoreline and the tall trees lining both sides of the channel. All we ended up doing was lengthening our anchor rode (chain) to a little over 5:1. This means for every foot of depth, we’d have 5 feet of chain let out to help keep our anchor well secured to the mud bottom. Once you are feeling prepared for the weather to come, you go about your days activities and wait for the “weather” to arrive. You get period updates to the forecast. Hopefully the forecast turns out to be the worst case scenario and what you actually experience is something less. In either case, weather stories are always told and retold when you have get togethers with other boaters. Based on the fearsome stories you hear from others, it’s a wonder any of us ever heads off on a boating adventure. In our case today, there were indeed very high winds (although we were well protected, so for us it didn’t feel so bad), we did get thunder storms in the evening and we did get rain, but never as bad as forecast. After midnight, all was calm. 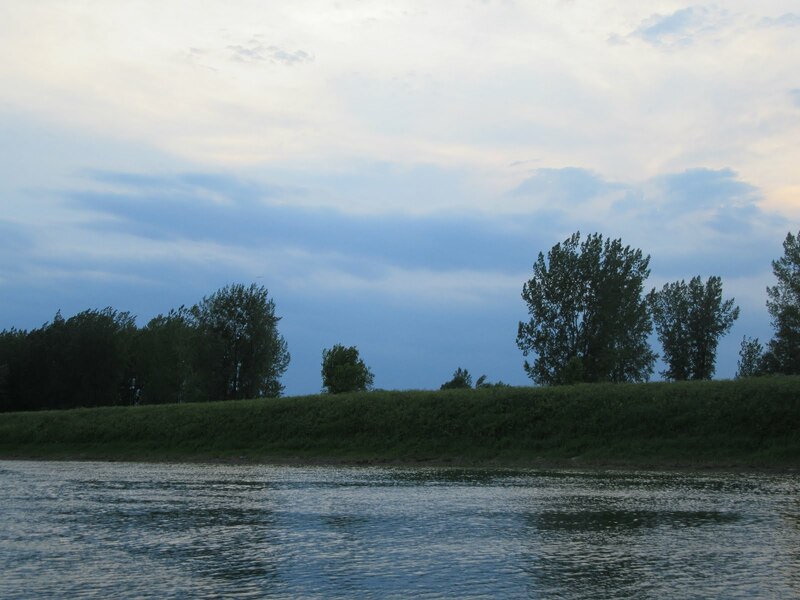 A successful conclusion to three nights at anchor at Boucherville Islands! 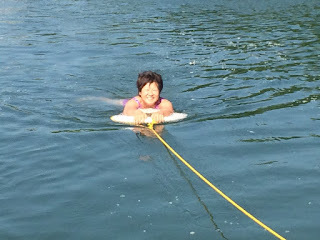 Fran in for a "life ring dip"